GA Profiles is an online recruitment platform for General Assembly's global alumni network. The goal of the project was to redesign GA Profiles to be an efficient and desirable tool for employers who want to hire GA graduates. We studied the hiring practices of employers and recruiters to design a hiring experience that streamlined the process within the context of General Assembly's network of graduates. Our main challenge was to present an overview of candidates that was comprehensible and personable, without being overwhelming. 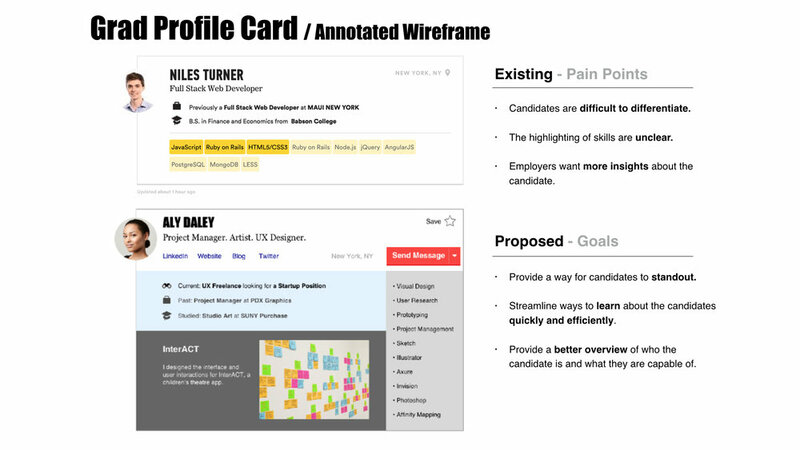 Currently, GA Profiles could be described as a minimum viable product. Its development had focused primarily on the use by the graduates, so it severely lacked features for the employer-facing side. The scope of our brief focused round how employers would interact with GA Profiles – more specifically, how hiring managers and recruiters would find, contact, and track candidates. Our goal was to create an optimal recruiting experience for employers to find and connect with candidates who match their hiring needs. We began our research by talking to 8 hiring managers and recruiters about their behaviors, preferences, and needs during the hiring process. We learned about their preferred platforms for hiring (of which we studied in our competitive analysis), what types of information qualified a candidate, and their procedures after identifying qualified candidates. We then validated what our users were telling us in our interviews by asking them to walkthrough their hiring process on the existing GA Profiles. From these observations, we quickly identified the pain points and opportunities for improvement. Hiring managers and recruiters expressed their desires for understanding the candidate's background, personality and goals, while not spending too much time on each candidate's profile. Our main challenge became providing the candidate's most important information in the appropriate amount that optimized the hiring manager's comprehension of the candidate. In terms of candidate qualifications, we noticed an important trend of two types of priorities among hiring managers. 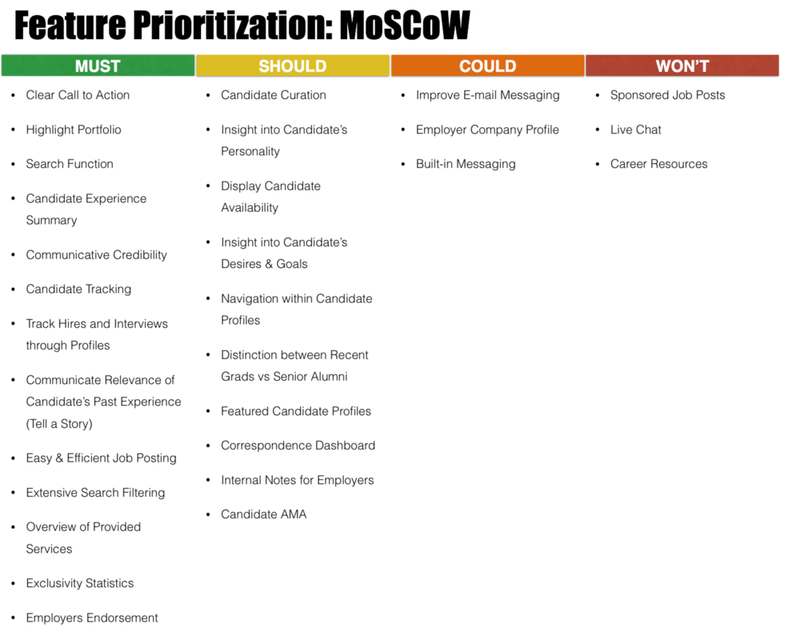 Within a spectrum between culture fit versus work quality, the users stated the importance of one over the other in how they qualified the candidate. Most of the users we tested wished for a search feature to discover candidates using keywords by specifying certain skills, experience and even interests. Users also expressed the difficulty of distinguishing candidates within the list. Hiring managers wanted an easy way of comparing candidates. Additionally, users wanted more filtering options, such as experience levels, education and specific industry. All of the users we tested were overwhelmed by the amount of text, with some of them not bothering to read at all for that reason. 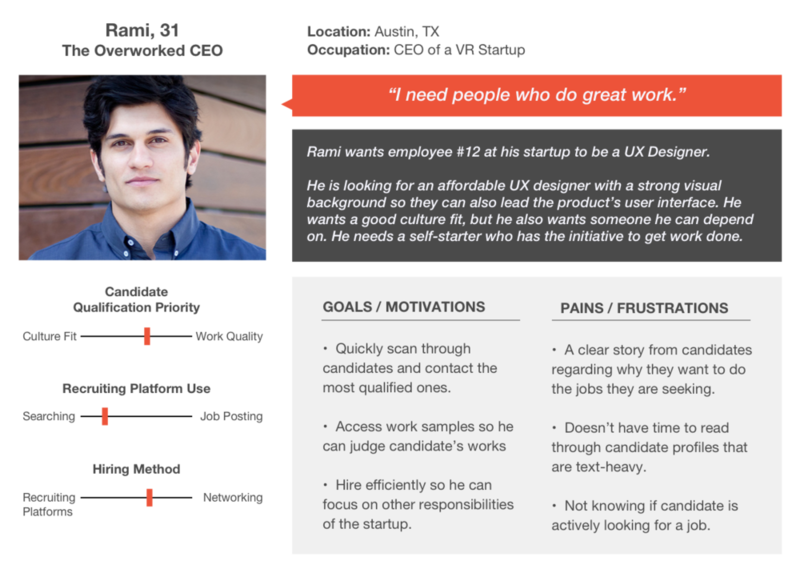 From the insights gained user interviews and initial usability testings, we identified two personas of users. Three categories of competitors were studied – Major Recruiting Platforms, Minor Recruiting Platforms and Bootcamps – to evaluate features that we could adapt for GA Profiles. We prioritized the list of potential features identified in the competitive analysis and user interviews. These features were arranged according to the level of impact and degrees of expectedness to organize them into groups of Must, Should, Could and Won't (MoSCoW method). Then these prioritized features were arranged by the respective pages they would fall under to aid in the design phase. Under the new global navigation option My Dashboard, users can access all of the new tools added to GA Profiles. These new features equip employers with more efficient ways to track and hire General Assembly graduates. Check out the Prototype in action!